Two leading AIDS researchers and activists – Chris Beyrer and Chris Collins sound a loud warning in the Lancet Global Health about the risks of a “too rapid” toward increased country ownership of the response to HIV and AIDS. While they underline that country ownership is “fundamental to long-term progress in global health”, they argue that many countries are not ready. Theirs is quite a different take from the one I put forward on this blog last week, and I feel they have fallen into the simplistic trap of seeing country ownership as being about governments. Much of their concern centres around the funding gap – and they are right to say that many countries are many years away from being able to finance their own AIDS responses (the same point could be made about health or welfare programmes in general). But country ownership is not just about where the money comes from – indeed the fact that country ownership is a core principle of aid effectiveness suggests that it has very little to do with the withdrawal of aid financing. This is not to say that the source of funding does not have an impact on ownership. As I argued in my post, even if a country “can’t support its health care needs right now, what it can do is start to claim a bigger stake in the funding and governance of its health”. Country level campaigns for increased government, private sector, and community spending on health are about countries claiming a bigger stake in their HIV programmes, and building the social contract at a national level. Beyrer and Collins rightly point to the fact that in many countries, health systems still have limited capacity to implement and monitor programmes. But ten years into the scale up of one of the largest global health ventures – the response to HIV and AIDS – surely this should be the signal for more effort in promoting country ownership in implementation. Promoting country ownership in the context of aid funding means doing much better in terms of building those local systems, and enabling the development of policies at country level. It means working with those who already own their national responses: governments, ministries of health, and NGOs. And it means using operating procedures that are suited to national systems. Another emerging challenge to country ownership is the consequence of donors’ increased focus on results and accountability. The focus itself is entirely appropriate. However, the processes that are being put in place to enable this focus are often premised on an international system of monitoring and auditing. Country ownership means that these functions too should reside at national level. In many countries there remain considerable barriers to certain types of programming – for instance with key populations. But while Beyrer and Collins are right to point out that most of the programming with these groups is externally funding, these programmes remain underfunded in most countries. The reason that less controversial programmes – such as for antiretroviral treatment and prevention of mother to child transmission – have scaled up so successfully is precisely because governments, ministries of health and NGOs at country level have readily embraced them. We will not see a satisfactory scale up of key population programming simply by mandating from global level that it must happen, or by approaching the issue primarily from the perspective of a humanitarian response. Decision makers, service providers, activists on the ground have to back it. Country ownership doesn’t mean abandoning people in need, it means recognising and working with these processes so that these needs can be met in a more meaningful, sustainable way. 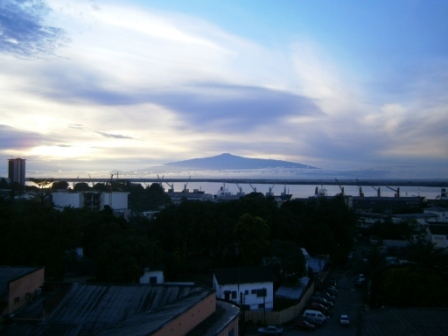 Mount Cameroon, with Douala port in the foreground. Because I’m sure you don’t need to see another picture of flipcharts or of people talking. I’m fortunate to have spent the past week working with a group of five health NGOs from West and Central Africa: CéRADIS from Benin, RAME from Burkina Faso, Positive Generation from Cameroon, and Femmes Plus and AMO from the Democratic Republic of Congo. They asked me to help them think through and plan their advocacy work, and I’ll be following up with some coaching to help them develop funding proposals. These groups are all involved in working with communities on health issues. With the global aid environment in full flux it’s been interesting to learn about the priorities as they see them. Here are a few highlights. Take the debate on health financing. In global circles we hear a lot about aid dependency, and about the need for countries to increase their own spending – largely in anticipation of a decreasing aid pot. Positive Generation in Cameroon also wants its government to spend more, but is under no illusions that even a massive increase – say to a 15% government budget spend, as per the Abuja declaration commitment – will be enough. But, they argue, even if Cameroon can’t support its health care needs right now, what it can do is start to claim a bigger stake in the funding and governance of its health. And this is precisely why, when Positive Generation campaigns for an increase in government spending, they aren’t just lobbying the president. They’re making sure that parliamentary as well as municipal electoral candidates are asked about their position on health funding. And they are so successful at doing this that many candidates are asking them to help them draft a position. They want to make sure that having a position on health funding becomes standard for anyone running for office. The same logic explains why these organisations are asking local businesses to invest and have a stake in improving health in their localities. It doesn’t stop there. Some of these NGOs are also working on the same theme at community level, talking with community members – users of health care – about whether local communal budgets should also set targets for how much they are spending on health. Communities are demanding not just better health services but are politicising the funding of health. Municipal budgets in these countries are small, and therefore so are the amounts this process will raise for the local health budget. But it is about the principle. It is about creating a norm or a standard, and showing to decision makers what matters to them; it’s about people having a stake in their health care. What about aid funded programmes? These organisations are fully engaged in aid programmes, both as implementers, and as watchdogs. But they are developing their own processes for monitoring what is going on. While there is a very practical reason for this – they want feedback to help improve services at local level, and they want data to identify systemic problems at national level – there is, again, a political dimension. In their view, while it is natural for international donors and researchers to care about their investments and closely monitor how they are being used, the communities at the receiving end should care even more. It is not that they disagree with the need for funds to be used wisely, or efficiently. Quite the contrary: but they feel that national civil society organisations, and communities, should be the ones making sure this is happening. Positive Generation leader Fogué Foguito put it this way: “I don’t need to wait for the Inspector General of hospitals to come round to point out that toilets in the health centre are filthy”. There is also a sense that while guidelines and conditions for aid developed at international level can help establish some useful principles for those working at country level, they can also act as a barrier to country level efforts to take the initiative on health. Take the Country Coordinating Mechanism (CCM), which the Global Fund to fight AIDS, Tuberculosis and Malaria requires all applicants to establish. Because CCMs are supposed to include civil society and community representation, they have opened the door to a more participatory, transparent approach to funding. However, by all accounts in most countries CCMs are not as inclusive as they should be, nor as effective at monitoring Global Fund programmes as they should be. The NGOs I have been working with are well aware of this, and yet they are sceptical of suggestions that the Global Fund should audit CCMs and introduce further measures to monitor CCM performance and train or redesign CCMs: “That’s just not where the priority lies! If we’re going to monitor something, why can’t we have support to monitor how programmes are getting delivered on the ground? We’re going to end up checking if people are going to meetings in the capital and if the minutes were circulated on time, and meanwhile the implementing organisations are off doing what they want with no-one paying any attention!”. This may seem counterintuitive since one of the main points of CCMs is to give a voice to actors outside of the government. But the conclusion from the NGOs I’ve been working with seems to be this: CCMs have been receiving training, funding, and “technical support” for over a decade. None of these institutions are perfect, and we don’t expect they ever will be. Imperfect as they are, we’ll keep on using the opportunities that they afford us (for instance, access to discussions that we wouldn’t otherwise be party to), but let’s not get sidetracked with more inputs: what we care about most of all is communities. Regular changes in international guidance and policy are also disruptive. Every time something new comes up – three ones, know your epidemic, strategic investment, new funding model* – there’s a new set of consultations and meetings and trainings. People are running around trying to figure out what global health is doing next rather than spending their time looking at what is happening in services on the ground. And what about “vertical” programming? For the most part these organisations started out working on AIDS. But when it comes to advocacy, the perspectives of these organisations are broad. When advocating for domestic financing, they are advocating for health financing. When advocating for rights, they are advocating the right to health. This is not because they consider AIDS to be over – far from it. AIDS remains very much at the heart of their aims, because despite improvements over recent years there remains much to do to get people on to treatment, protect peoples’ rights, and reach marginalised groups. But in their desire to base their advocacy on a strong community movement, rather than on abstract principles, they are driven by the fact that people facing health crises don’t necessarily distinguish between one illness and another, or one type of service and another. Just as people by and large don’t particularly care whether the health care they get was paid for by the government, by a local business, or by an international donor. What they care about is whether it is good, and whether it is accessible. The word that perhaps best sums up this approach is “sovereignty”. It may be an archaic word but it is probably time we found an alternative to “country ownership”, which sounds right but which mostly leads to a polarised, caricatured debate between “government decides” and “donor decides”. Sovereignty is not about rejecting aid, or evidence, or good practices, or international solidarity and nor is it about saying governments are paramount. It is about shifting the locus of debate and ownership to individuals, organisations, and officials in countries. It is about getting people, and providers, and businesses, and administrators, and politicians, to have a bigger stake in health, in their countries – which is, after all, where politics and power are. *I can’t resist a digression. These “new” initiatives – that appear every couple of years in the AIDS sector – are rarely, if ever, particularly new. They are new labels for incremental developments in the field. Incremental developments are a good thing. But they would be far more helpful if they weren’t promoted, campaign-style, as the latest magic bullet for a world without AIDS, accompanied by the requirement that countries start planning all over again. Finally, a quick practical note. The meeting was designed and planned by the NGOs listed above, and was funded by GIZ’s Backup Initiative following their request to GIZ for support. Backup is a good source of support for civil society organisations working on monitoring and strengthening Global Fund programmes in their countries.